I am the first to admit that there are days when I just want to throw in the towel and escape to an island with a beautiful white sand beach, turquoise water rippling with rainbows of tropical fish, hotel staff wanting nothing more than to ensure my happiness, and most of all, quiet. Quiet from the kids and quiet from the day to day trials and tribulations of parenthood. What usually happens soon after I have these fantasies of solitude, however, is that the girls snuff out my desire to escape. They say or do something to bring me back to my small corner of earth and remind me that I’d actually miss them if I spent too long communing with nature in some far-flung paradise. Chloe and Sophie gave me lots of reasons this week to put off my travel plans, at least until after the new year. Here’s a sampling of why I won’t be needing my passport any time soon. (1) Chloe announced that for her 13th birthday she’d like me to take her and her friends to the Strand Bookstore in New York and give each of them $10 to spend on books. She then decided to put her book-themed birthday celebration on hold until she and her friends are old enough to go into New York alone. Of her closest friends, Chloe is by far the most voracious reader. Not sure how they’d all feel about such a party, but I think they’d go along with it because if nothing else, it’s an excursion to New York. (2) Sophie’s out-of-left-field announcement the other night: “I think I’m too old to cuddle.” My heart skipped a beat when she said that, and not in a good way. Faithful readers of this blog know that I often talk about Sophie’s remarkable cuddling skills. How can she be too old to cuddle when she still believes in Santa (and yes, lest we traumatize her psychologically for life, I know we’re going to have to disabuse her of the Santa myth soon)? After she made this proclamation, I started searching airfares on www.kayak.com to see if I could find a cheap trip to palm trees and coconuts. 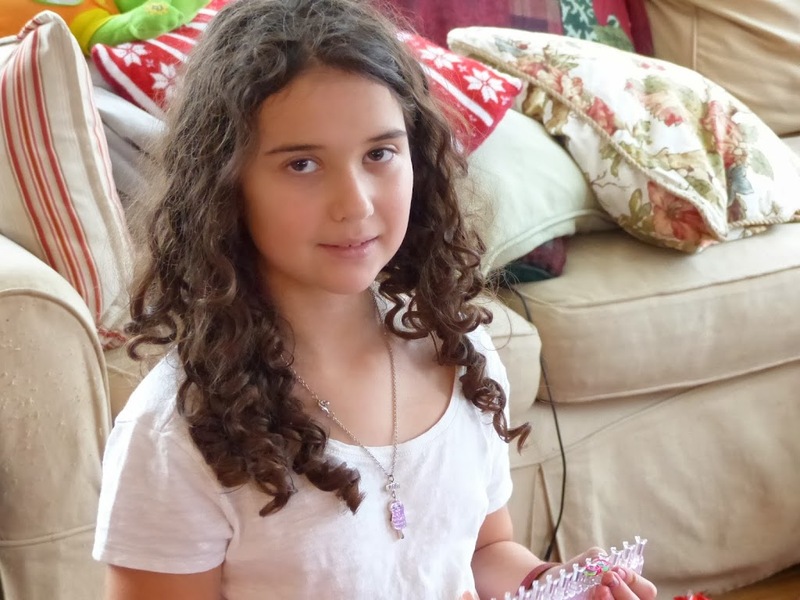 On the way to school the next morning – and completely out of the blue – Sophie then said, with little fanfare, “Maybe I’m not too old to cuddle, mom.” That’s my girl. You just saved me hundreds of dollars on a plane ticket. (3) Chloe attempted to make me a birthday cake last week. She saw a recipe in an early-20th century French cookbook that I bought when I was feeling ambitious and more French than American. The recipe was labeled “simple.” Needless to say, Chloe didn’t bother to read the recipe beyond “simple” before embarking on her attempt at pseudo-haute cuisine. She admitted that she didn’t follow the instructions. Needless to say, the cake was horrible. It was hollow inside (how in the hell she managed that, I have no idea) and just plain inedible. That recipe may not have been simple, but my needs and wants are extremely simple. All I wanted was a chocolate mousse cake from my favorite Italian bakery. I have to admit that I initially felt more than a little disappointed that I didn’t get to enjoy a real cake for turning “half of 90.” As I thought more about the episode, however, the funnier it was. Let’s face it, I can always go to my favorite Italian bakery, birthday or not. 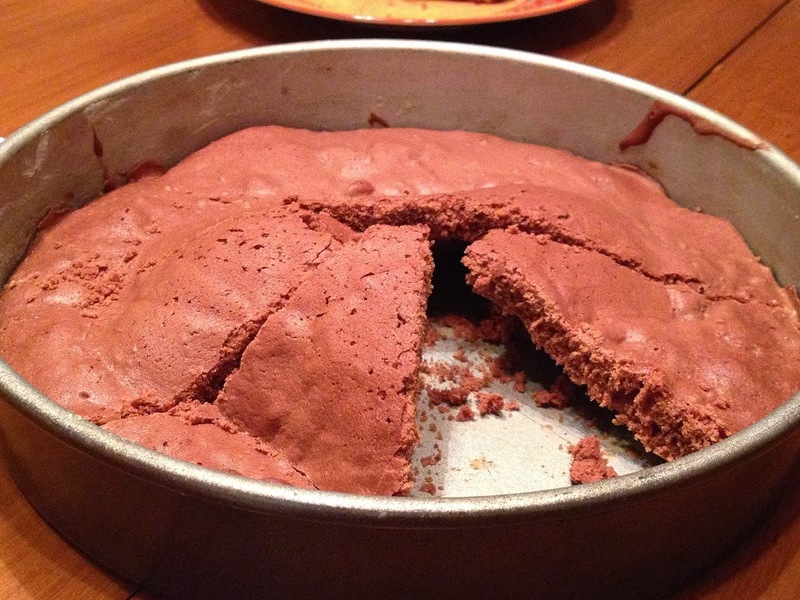 But I won’t often be treated to an inedible homemade cake made with love by my oldest child. And next year I will buy myself my own birthday cake. And that’s that. (4) Sophie’s birthday present to me was one of the most thoughtful gifts I’ve ever received. Whenever she loses one of her prized possessions (she has so many prized possessions that “prized” no longer has much meaning) she turns to me to find them for her. And I am often successful, which is one of my greatest talents as a mom. 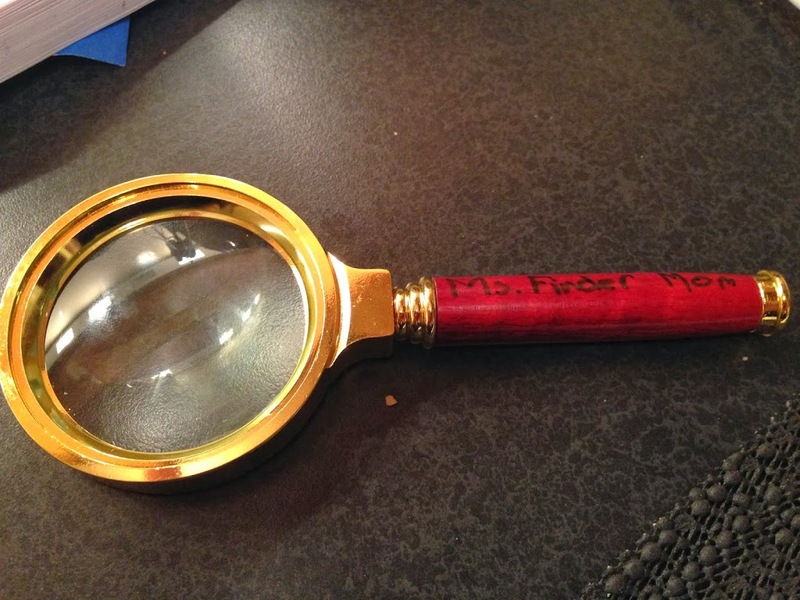 To acknowledge this aptitude, Sophie presented me with a magnifying glass that she inscribed with the words, “Ms. Finder Mom.” I’ve used it twice already. I’m starting to feel a bit like Sherlock Holmes. Not the Benedict Cumberbatch portrayal, mind you (“Sherlock” is super, by the way and is definitely worth checking out), but more like the Basil Rathbone version. (5) Last evening Sophie came to my room to beg me to join her, Chloe and my husband for a game of Imaginiff. Usually the kids have to beg their Papa to play, but this time Sophie had to plead with me. I was curled up in bed enjoying an episode of the aforementioned “Sherlock” and I declined her sincere invitation to “play the game as a family, which we never do.” She left the room, head down, abject disappointment on her face. Sophie’s relentless, though. After a few seconds, she returned. Looked at me with her big brown eyes cast downward and her puckered lips, knowing full well it’s a mug I cannot resist. So to the living room I went, wanting desperately to be back upstairs watching my show. We played the dumb game for almost an hour (at least it seemed like an hour – although it might not have been more than 30 minutes). And for once, I didn’t mind being completely manipulated by my 8-year old girl.